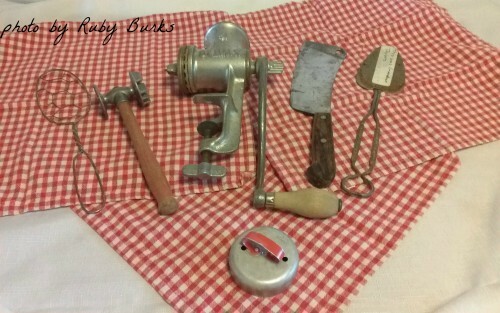 I love my KitchenAide stand mixer and my multi-functional, motorized food processor, but in past generations many of these tools relied on elbow grease instead of electricity, and although you can find modern versions of these tools today, I prefer the vintage versions. The vintage versions of these tools were made in the USA, built to last, and geared towards American practicality. In the past, recipes in cookbooks relied on readily available ingredients that were usually locally sourced to create delicious, filling, and nutritious meals. Very little was wasted, including leftovers. 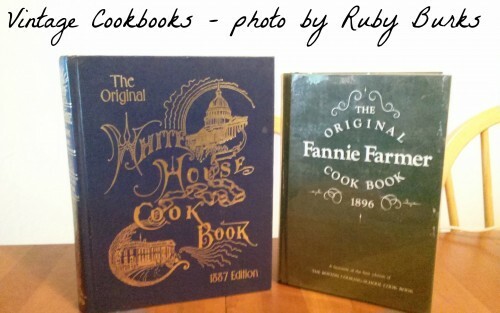 The Original Fannie Farmer Cookbook 1896 (a facsimile of the first edition of The Boston Cooking-School Cookbook by Fannie Merritt Farmer, published by Crown Publishers, Inc). Note: Care should always be taken when using old recipes that they comply with modern food safety standards. “Six pounds of shin of beef, or six pounds of knuckle of veal; any bones, trimmings of poultry, or fresh meat; one-quarter pound of lean bacon or ham, two ounces of butter, two large onions, each stuck with cloves; one turnip, three carrots, one head of celery, two ounces of salt, one-half teaspoon of whole pepper, one large blade of mace, one bunch of savory herbs except sage, four quarts and one half-pint of cold water. Author’s note: a “fine hair sieve” is not made of hair. It’s made of fine wire like this one here. “There are several recipes for preserving eggs, and we give first one which we know to be effectual, keeping them fresh from August until Spring. Take a piece of quick-lime as large as a good-sized lemon, and two tea cupfuls of salt; put it into a large vessel and slack it with a gallon of boiling water. It will boil and bubble until thick as cream; when it is cold, pour off the top, which will be perfectly clear. Drain off this liquor, and pour it over your eggs; see that the liquor more than covers them. A stone jar is most convenient; – one that holds about six quarts. Another manner of preserving eggs is to pack them in a jar with layers of salt between, the large end downward, with a thick layer o salt at the top; cover tightly, and set in a cool place. 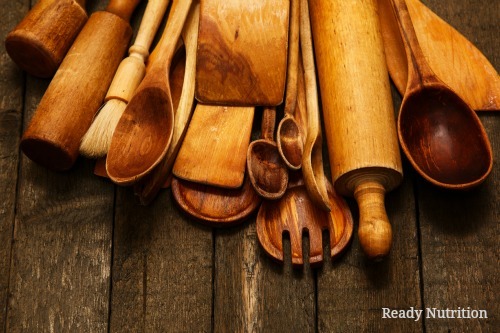 Nothing beats good hand tools, especially if they come passed down from previous cooks and with fond memories. Mawmaw Burks’ deep fry spatula – I don’t know if this was store-bought or if it was handmade, but I love the ingenuity of using chicken wire to make a kitchen tool. My mother’s meat tenderizer- many delicious chicken-fried steaks were made using this meat tenderizer and it’s still useful today to tenderize less expensive cuts of meat prior to cooking. A meat cleaver I picked up at a thrift-store years ago for under $5 – no kitchen should be without a meat cleaver. I use this one regularly (as you can see by the wear) and keep it sharp. Cleavers are great for cutting through joints and reducing the strain on your hands when cutting and wrapping large quantities of meat. A word of caution: be sure to use a thick cutting board when using a cleaver. A cleaver will go right through those flexible, flimsy plastic cutting boards. My Great-Grandmother Taylor’s spatula. This is one of the vintage tools in my kitchen I no longer use for fear of breaking it. I labeled it to make sure it wouldn’t get used by anyone else in the household. 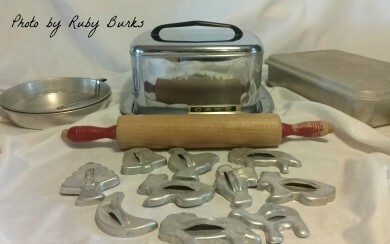 The handle reads, “Albers Flapjack Flour” on one side of the handle and “Peacock Buckwheat Flour” on the other side. There’s a bottle opener at the end of the handle. There are a few of them available on eBay, but then it wouldn’t be the very one my great-grandmother used. Possibly my most prized vintage tool of all- my Grandmother Ham’s biscuit cutter. I was born sickly, as they used to say, and spent a lot of time at Grandmother Ham’s house recuperating. As the fifth child in a family of six kids, it was wonderful to get undivided attention from Grandmother. While recovering from measles, the only thing I would eat was her rolled biscuits with lots of butter and honey. And ice cream. Lots and lots of ice cream. There’s a center piece in the cutter that can be removed to cut biscuits, or when left in, it cuts a hole for donuts- deep fried and still warm, sprinkled with granulated sugar. Mothers love their children, but grandmothers spoil them. And that’s a good thing. My children are all grown now (bring on the grandbabies! ), but when they were young, they each got to choose their favorite birthday cake made from scratch. During the holidays, my kitchen was filled with children and cookies. My children, their friends from school, and the neighbor’s children were all invited over for a day of decorating sugar cookies. Parents were asked to contribute whatever they could towards the festivities (a bag of flour or sugar, jimmies or other decorations, a pound of butter – whatever they felt like they could afford), and advised to bring their own plate so their children could take their creations home. I had more than a few children show up on Cookie Day without anything to contribute and none were ever turned away. I like to think Grandmother Ham would have been proud of me.